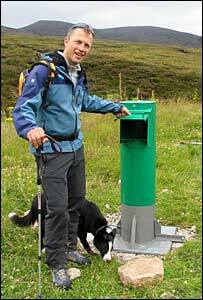 Climbers and hill walkers are being asked to bag and bottle their waste and deposit it in a "poo chute". The effort has been launched in the Cairngorms following concerns about contamination of the River Nethy and Loch Avon Basin. Faeces have also been found in snow holes - shelters dug into a snow-covered hillside - at Ciste Mhearad and Coire Domhain. The chute has been set up near the Cairngorm Ski Area car park. Cairngorm Ranger Service is helping to lead the effort. The service is being offered free of charge and visitors can pick up bags and a light, rigid bottle with a screw top called a BHD from the ranger base. Coming off the hills, walkers and climbers can deposit the bags - which are soluble at 40C - down the chute into a sewage plant and place the bottles in a sterilization barrel. Ranger Heather Morning said: "Spending the night in a snow hole in the Cairngorms is a popular activity - whether as part of a winter mountain leader course or just for pleasure. "Like all activities in the hills, if only a few folk are doing it then it's not a problem but with increasing numbers now enjoying the Scottish winter hills, snow hole sites are sadly becoming environmental disaster areas." She added: "When the snow melts in the summer months at the popular sites of Ciste Mhearad and Coire Domhain, our human impact is all too apparent."